Alfred Clough - Fireman in charge of the firing and member of the organising committee. The museum presented Mr. Clough with No.1 saggar and a commemorative tyg from the firing. George Fairweather - the owner of Hudson and Middleton, Longton Ltd., Sutherland Works where the bottle oven firing took place, worked closely with the team for a long time and without his cooperation and generosity the firing could not have taken place. These are the 72 volunteers listed as doing some work during the Last Bottle Oven Firing 1978. We believe that it is complete but sincerely apologise if we have missed anyone. Although not listed here we must not forget the museum staff and regular volunteers who kept the museum open to visitors during the event. Placers were required for the first three days, 26, 27 and 28 August 1978. Drawers were required on Saturday 2 September 1978. Ovenmen and oddmen were required from Tuesday lunch 29 August, through the night to Wednesday evening 30 August at 22:00. Jack Hill took the firing during the night shift but he could not do any baiting himself. inspecting the oven before it was brought back to life. 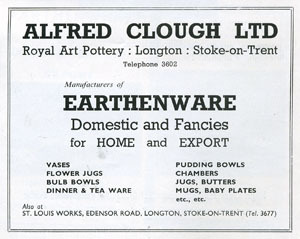 ALFRED CLOUGH Master potter. 27 May 1905 - 1984. Pottery owner from Longton, Stoke-on-Trent, who mass-produced printed earthenware, dinner and tea ware, for sales outlets such as Woolworths. By 1960 he also owned W H Grindley, Cartright and Edwards, Barker Bros, and Royal Art Pottery. He operated, at one time, from the Garfield Works in Longton. In his hey day he owned over 30 local factories and employed over 2000 people. A major force in the industry.